West Sussex County Council has voted to support an A27 bypass near Binsted for Arundel. Highways England has been told that the county council’s preferred route is Option 5A – with the proviso that a package of environmental mitigation measures is introduced. Councillor Bob Lanzer, the council’s cabinet member for highways and infrastructure, said: “Overall, the environmental impacts of Option 5A, if appropriately mitigated, are likely to be significantly outweighed by the substantial economic benefits of this option over the longer term. “This is why, provided that a high-quality package of environmental mitigation measures is identified and delivered as part of the scheme, Option 5A is the council’s preferred option for an A27 Arundel bypass. At the end of September, the council’s Environmental and Community Services Select Committee scrutinised a draft response to the consultation on three options put forward by Highways England and heard from community representatives with different viewpoints. 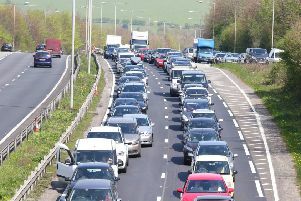 Mr Lanzer said: “The committee concluded that, of the options presented by Highways England, Option 5A would have the most benefit to traffic and the economy by relieving congestion at Arundel and attracting traffic that currently rat runs through residential areas and South Downs National Park to avoid congestion. “However, they also recognised that it would have an adverse effect on the environment and people who live in Binsted, so recommended that a high-quality package of environmental mitigation measures be delivered as part of the scheme. The decision to recommend Option 5A to Highways England is subject to the council’s usual call-in period. The public consultation on options for an A27 Arundel bypass began on August 22 and ended on Monday. Once all consultation responses have been analysed by Highways England, a preferred route is expected to be announced this winter by the Secretary of State.